A rare vintage white tea sealed with kumquat peels giving a mellow, subtly sweet and delicately perfumed infusion reminiscent of floating clouds and dreamy days. 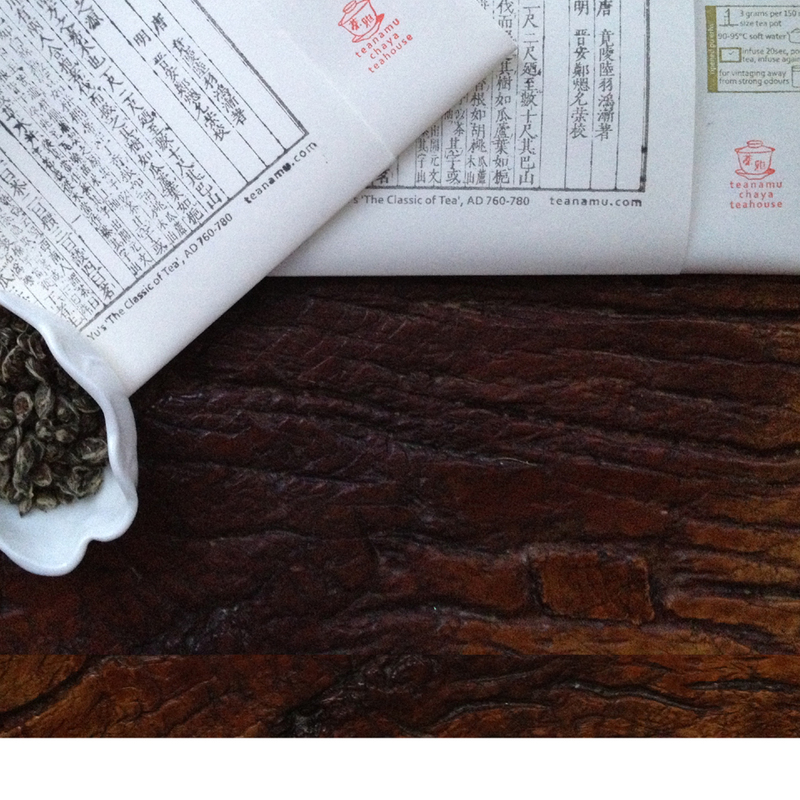 We are excited to share this very rare white tea from Fuding (Fujian, China). The Bai Mu Dan (White Peony 白牡丹) tea leaves are harvested in spring of 2014 and have been carefully vintaged since. They are expertly pressed into thin slices with the peels of the kumquat fruit. These delicately perfumed fruit peels are taken from the little green kumquats harvested in 2016. The aged white tea leaves impart a lovely subtle sweetness and mellowness to the infusion. Coupled with the oil from the kamquat peels, this tea infusion has a refreshingly citrusy flavour with none of the bitterness and astringency. Without the friskiness of freshly harvested white tea leaves, this tea is perfect for a perk me up in the mornings and afternoons and as a soothing tea in the evenings. Kumquat Peony Thin is perfectly sized to be brewed in a mug, glass pot, traditional gaiwan or in our travel chinois tea set, It can be infused in hot or cold water multiple times. Each slice is about 5 to 6 grams (5cm square) and is individually wrapped in a paper envelope and sealed in an aluminium foil pouch. They are available as 5 or 10-piece portions. Kumquat Peony Thins can be vintaged but we doubt you will be able to resist infusing them. 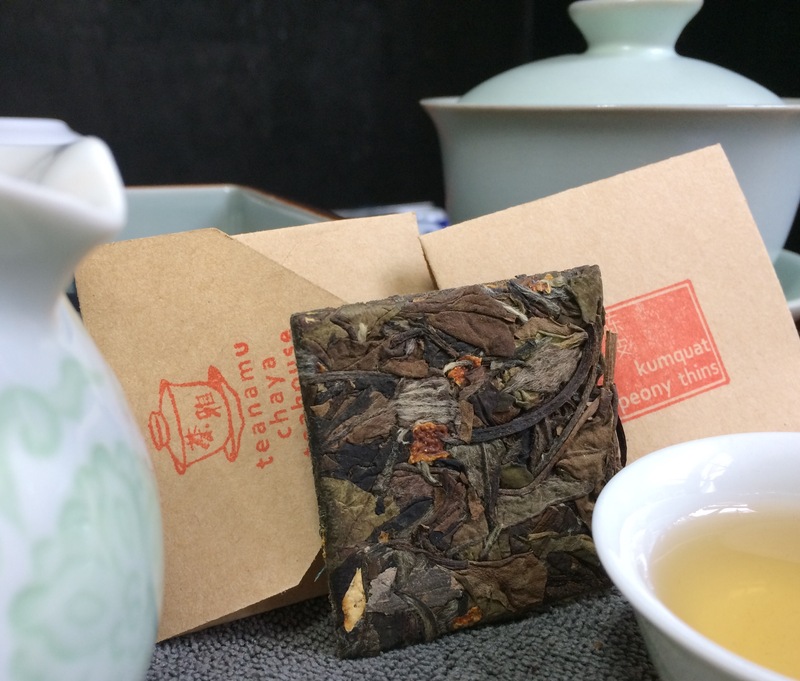 This tea is supplied in paper envelopes in a zip-loc foil pack to prolong its fresh flavour, within a beautiful paper wrap hand-stamped with an extract from the 8th century tea classic Cha Jing. Infuse 1 piece of Kumquat Peony Thin in pot and pour 180ml to 200ml water at around 85°C to 90°C. Infuse for one minute for each infusion and enjoy the gradual release of flavours of the white tea leaves and kamquat peels. 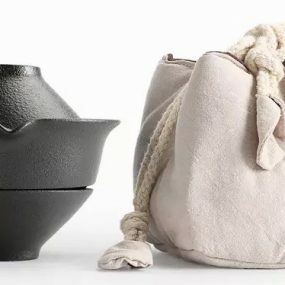 Infuse 1 piece of Kumquat Peony Thin in 500ml water in a jug. Let it infuse in your fridge over several hours or overnight.